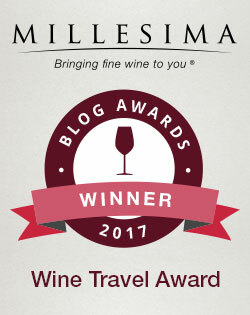 Both sources agree that the best versions of Vernaccia di San Gimignano are “crisp,” with Sotheby’s praising its “vibrant fruit” and the Oxford Companion extolling its “refreshing quality,” “attractively bitter finish” and “unquestioned superiority over the standard bland Tuscan white blend of Trebbiano and Malvasia.” That’s better, but even these positive comments seem to be a case of damning with faint praise. 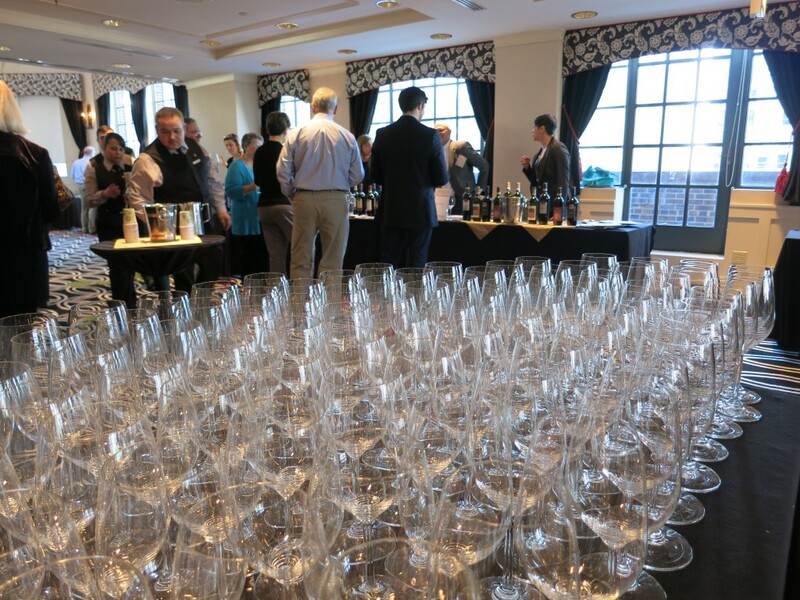 Nevertheless, because Vernaccia di San Gimignano ranked as one of the most unusual options at a recent tasting of Tuscan wines, I dutifully gave a few a try. Each producer I visited offered at least two versions, an unoaked wine and a wine that had spent some time in barriques (oak barrels). The Oxford Companion takes a vaguely dismissive attitude towards “attempts to give it additional complexity with small barrel maturation,” but the technique worked for me. Each of the barrel-aged versions I tried, as indicated by the word “Riserva” on the label, was delicious. The unoaked Vernaccias di San Gimignano I sampled tended to have cheerful fruit, limey acids, some white-pepper spiciness and often a hint of salinity. They tasted refreshing, and with their tartly bright acids, I suspect they’re at their best with food. The barrel-aged wines achieved another level entirely, mellowing the texture and adding additional layers of flavor. The 2012 Fattoria Poggio Alloro Vernaccia di San Gimignano Riserva “Le Mandorle”, aged in new French oak, was more brooding than the unoaked Vernaccias, with notes of dark orange and cream and broader, rounder acids. I also enjoyed the 2012 Cantine Guidi 1929 Vernaccia di San Gimignano Riserva “Aurea”, with its aroma of creamy white fruit and roasted grapes. 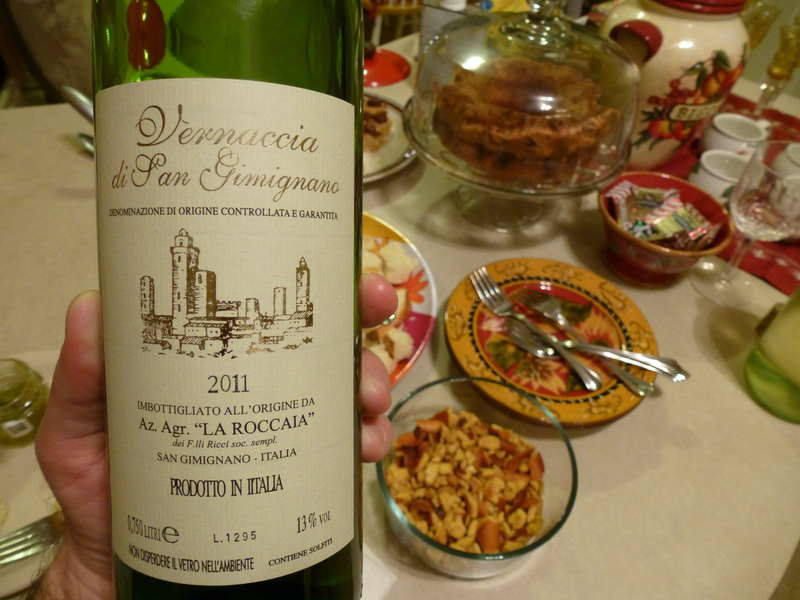 It tasted rich, but it had a delightful green freshness and distinct focus, with a zap of spice. 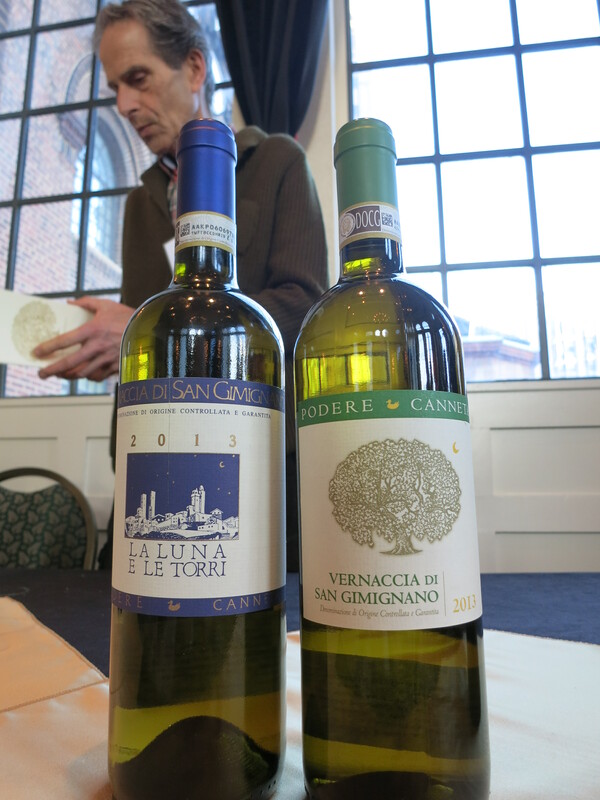 As tasty as these wines were, my personal favorite was the 2013 Podere Canneta Vernaccia di San Gimignano Riserva “La Luna e Le Torri”, which translates to “The Moon and the Towers,” referencing the amount of time the wine ferments — one lunar month — and the famous medieval towers of the city of San Gimignano. A blend of 85% Vernaccia di San Gimignano and 15% Sauvignon Blanc, this wine spends a year in used oak barrels aging on the lees, adding to the complexity of the wine. It had an appealing aroma of lime and popcorn, and flavors of creamy white fruit and pie crust. 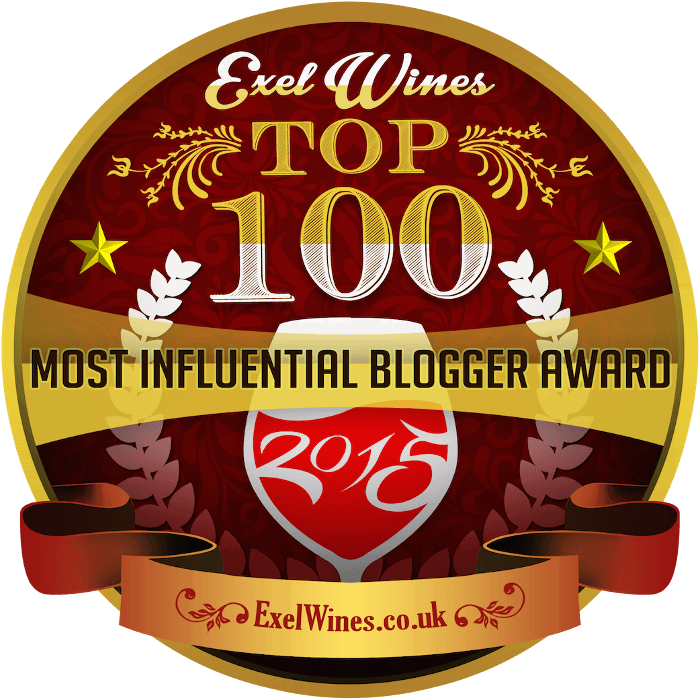 It felt beautifully balanced, with supple acids and a bit of minerality. 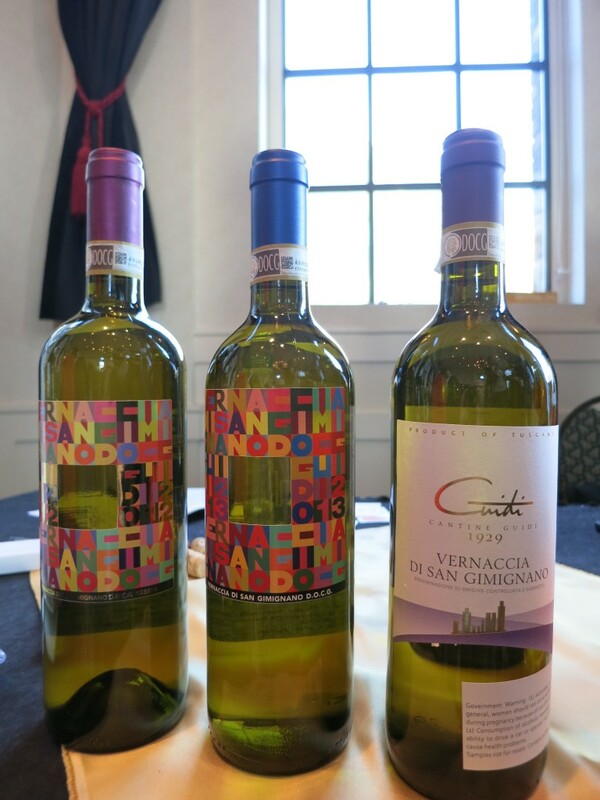 Unfortunately, Vernaccia di San Gimignano Riserva wines can be difficult to find. But keep that name in the back of your mind, because at some point, you’ll likely encounter a shop or a wine list that has one. I highly recommend trying it. A scan of Wine Searcher revealed that most Vernaccia di San Gimignano Riserva wines retail between $15 and $30, and that’s a steal, even towards the higher end of that scale. It’s a shame that the wine he transported so carefully for thousands of miles was so disappointing, but I must admit I couldn’t wait to see what this apparent train wreck of a wine tasted like. The nose didn’t seem so bad: Green, citrusy, and minerally. But I could see why our host, a fan of fine Rieslings, would find this wine so unpalatable. It tasted bracingly tart, with very focused, limey acids. The wine didn’t unclench until the very end, when it broadened a bit, finishing with a bit of stone. What distressed me was its watery underbelly. The tight acidity may have been what the winemakers were going for, but I doubt that they intended the wine to have such flabby fruit. 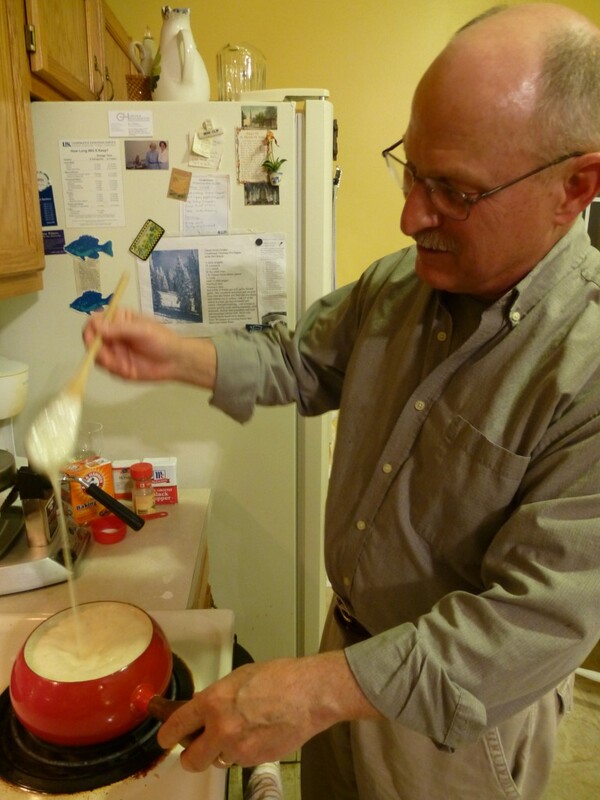 Fortunately, we were having some classic cheese fondue for our main course, and the fondue saved the day. The pointy acids of the wine cut right through the richness of the cheese, clearing the way for the next bite. It was quite a fine pairing, in fact! I don’t necessarily relish the prospect of drinking this wine again on its own, but the acids made it undeniably food-friendly . If you go out looking for some Vernaccia to pair with a rich cream sauce or some cheese, note that Vernaccia di San Gimignano is only one of several very different-tasting Vernaccias produced in Italy. And it’s not just a matter of terroir. The Vernaccia grown around San Gimignano isn’t even the same variety as the Vernaccias grown elsewhere. According to The Oxford Companion to Wine, Vernaccia di Serrapetrona is a fizzy red, for example, and Vernaccia di Oristano is almost sherry-like. The name “Vernaccia,” it turns out, means essentially “indigenous,” and it can refer to the indigenous varieties found in a number of Italian localities. Vernaccia di San Gimignano won’t please everyone, if this bottle is any indication, but if you’re planning on serving something like fondue, brie en croute, raclette or fettuccine alfredo, its crisp acids might just make it a perfect match.